The best circular saw is one that gets the job done. The five best circular saws are reviewed and compared. Make the best choice. A circular saw is an awesome power tool - no question. Every good workshop should have one - and don't rule yourself out if you're at the home improvement level. They cut out a lot of labor intensive work and nothing cuts as fast as what's often termed a buzz saw. Before you buy - make sure you choose the one that best fits your requirements. A wood circular saw isn't going to handle concrete or some metals for example so save yourself time and money and select the correct model prior to purchase. The five best selling circular saws are featured below. Each one is in the most popular category, selling by the thousand, plus they're all top value for money and highly rated overall. This is the best selling circular saw with laser sighting and comes from the well known and trusted Skil. What can I say - it's an awesome power tool. It's got everything I want in a saw and even better - it's less than 70 bucks. It's powered along by a 2.5 hp motor, all good, and will cut through a variety of different wood projects with ease. The blade's a 7-1/4", perfect for a myriad of tasks, and will cut at both 45º and 90º angles - neat. The laser is an impressive feature, adding to the precision of the cut and final finish of the project. I liked how easily it dealt with decking boards, then ably tackled a small back-yards worth of fence posts. There's storage for wrenches, a power-on led indicator, rear lever adjustment, a lock out switch and much more. The whole kit comes complete with a carry bag - top deal, one to buy. 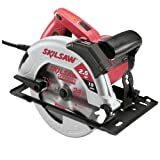 This is the best selling cordless circular saw and definitely lives up to the manufacturer's claim that it offers the most rapid cuts and can rip through wood like a hot knife through butter. The blade's carbide tipped for added strength and cutting power, 6-1/2" in diameter and cuts at both 45 and 90º angles. It'll work with all types of two-by wood, has an upper guard for the blade, a fan that keeps the motor cool, bevel degrees that alter between 0 - 50 and won't vibrate your hands into oblivion. Comfortable, secure grip, compact and user friendly - all features that help makes this an impressive small circular saw. Top saw for home improvement enthusiasts, currently retailing at around 100 bucks. This is the most popular Bosch circular saw and comes in at just under 90 dollars. What do you get for the best part of $100? Well - you get a power tool that will rip though just about any type of lumber you point it at. The motor is pretty powerful at 15 amps, the blade diameter is 7-1/4", a lower anti snagging guard and the fact that the blade is on the left is a great improvement when it comes to line of sight. It's an excellent cutting solution for a variety of tasks and I had it running through plywood sheets without issue. Time and again the left hand blade proved it's beneficial position and everything it ripped - it ripped with precision. The cutting angles and depth adjustment is a breeze and all the little details - such as levers for all adjusting - make this stand out. Awesome power tool for home users. A Makita circular saw. Top dollar but with this one you're getting an industry standard, superior quality power tool. It's driven by a lithium-ion 18v battery, which throws out an awesome 3,700 rpm. Despite the power it delivers, it's compact - streamlined and ergonomic in its design and incredibly easy to work with. Down time is lessened by the use of the second battery - one on charge, one in use. There's an on-board led light that illuminates when you're in a dark spot, a dust removal feature, and a 6-1/2" carbide tipped cutting blade. It will cut through all 2-by material without question and you can control it on three levels - voltage, thermal and current. A superb example of industrial standard engineering - currently sold at a great discount and comes with all you need to get started - the saw, a pair of batteries, rapid charger, rip fence and a specially designed case. 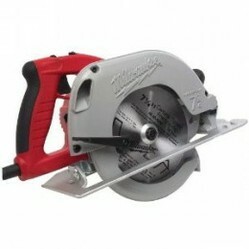 Another best selling electric circular saw, this one from Milwaukee. The kit includes the saw, useful wrench and a sturdy carry case. The motor is 15 amps - plenty of power for getting on with the task at hand. It also includes an ability missing form the other featured power tools - you can lock and tilt it through 8 different positions. The adjustment is done in a hot second by way of a simple push-button feature and it rips through lumber at a powerful 5800 rpm. On start-up it's smooth, doesn't vibrate unnecessarily, feels pretty comfortable and secure to hold and work with. The bevel and depth altering its as easy as pie and of course there's the obligatory blade guard. Lots of features, high on quality, low on price - currently retailing at under $130. Recommended purchase.